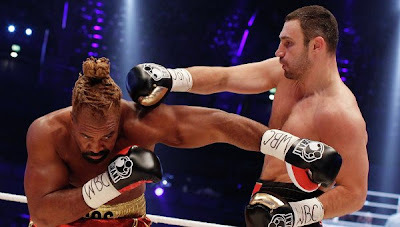 HAMBURG, Germany -- Ukraine's WBC Heavyweight Champion 'Dr. Ironfist' Vitali Klitschko (40-2, 38 KOs) defeated U.S. Shannon 'The Cannon' Briggs (51-5-1-1, 45 KOs) on points and defended his champion title. Vitali Klitschko defends title by defeating U.S. challenger. The two heavyweights faced off early on Sunday at O2 World Hamburg arena in Hamburg, Germany. Fighting in his usual conservative style, Klitschko, 39, steadily built up pressure on the challenger, and by the sixth round dominated the match. Briggs, 38, showed a formidable stamina, withstanding Klitschko's onslaught until the end of the bout. Klitschko defended his title for the fifth time since he beat Samuel Peter in October 2008 to regain the WBC crown. Briggs, returned to the spotlight following a three-year rebuilding process after losing the WBO belt to Sultan Ibragimov. He has fought four times since, scoring three first round knockouts and one No Contest.